With All-Star weekend hangovers long gone fans are settling in for their teams to make that final push towards the playoffs. For supporters of the Heat, Bulls, Thunder, Spurs and Clippers it’s business as usual. What’s new in the grand scheme of things is the emergence of teams that have finally gotten their heads above water. The goal for every club in October is to win a championship and for those that understand it’s unlikely in such a top heavy league, making the playoffs keeps some hope alive. Once the bracket is set every series is one ejection, one injury or one game winning shot away from the next round. Out of the top 10 largest team salaries in the NBA last years finalists the Spurs and even more so the Heat have the best chances of hoisting the Larry O’Brien trophy in 2014. With the understanding that injuries and trades have played a major role in season results, other top spending franchises such as the Nets, Lakers, Celtics, Knicks, Grizzlies, Bulls and Denver are in no way striking fear into their opponents in the foreseeable future. As of late many rosters have benefited from overnight success by landing All-Star talent, however there has been an offbeat approach surfacing in the NBA. A trend that dates back to the once struggling 2009 Oklahoma City Thunder to the 2014 Indiana Pacers who also went from duds to studs in five years. Both have become powerhouses in the league by managing rosters the right way not only financially but in terms of dealing with talent realistically. To help put it into perspective neither team is among the top 10 spenders when it comes to team salary. 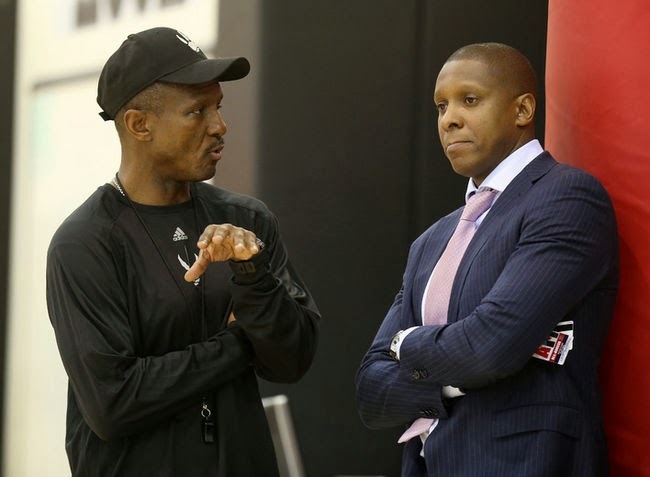 It would appear that the Toronto Raptors and Washington Wizards have adopted this philosophy which has resulted in success making it easier for fans to digest. Over the last several years both teams have been labelled as either ones to watch out for or ones to finally make it over the hump now living up to expectations. The Raptors who finished in the 7th spot with the Wizards who held the 5th seed made their last appearance in the playoffs in 2008. As of today the Raptors sit in 3rd place in the Eastern conference with the Wizards not far behind in the 5th spot. Staying true to the gospel of building talent and success for the long term Toronto currently sits outside the top 10 biggest spenders with the Wizards just over the border at number 9. It seems like ages ago that all Charlotte Bobcat jokes were reserved for the Los Angeles Clippers and the term “Portland Jail Blazers” was standard NBA vocabulary. It now appears you can either hit the All-Star lottery or dig your feet into the dirt and create something money can’t buy. Chemistry, thick skin through past failures and the mindset that there is nowhere to go but up with little media expectations and the distractions that come with it. The Spurs are notorious for flying under the radar and year after year use it to their advantage. The Pacers have perfected this system and even as they sit atop the Eastern Conference standings with a 41-13 record, I am hard pressed to find a cover story on any major online sports websites.The NBA heroes of tomorrow will no doubt continue to be the most coveted and expensive players money can buy. It’s the winners of the future that might very well end up being the exact opposite.